Hall, Elevator, and Emergency Phones - These Telephone Sets are designed for flush mounting in elevators or where a standard wall mounted telephone might be subject to accidental damage, cause injury or occupy valuable space, such as hallways. The set components are mounted on a heavy-gauge formed sheetsteel panel finished in black baked enamel. The handset contains a powerful magnet, which holds it securely in place. In accordance with FCC regulations, all handsets furnished with these telephones are equipped with Hearing Aid Compatible amplified receiver units with automatic volume reset. Speakerphone models have a momentary switch which automatically disconnects after two minutes. All models are fully powered from the telephone line and offer vandal resistant construction. Panel is mounted to the Wall Can with tamper-proof screws. 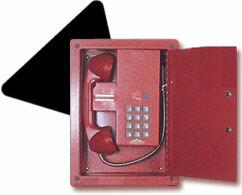 Except in the case of the Speakerphone, installation of these sets requires a GB62247 Outlet Box. The GB62248 Frame is optional and must be ordered separately. The wall can fit a recess measuring approximately 10 1/4"H x 7 1/4"W x 3"D. The Speakerphones include a wall can and ringer. 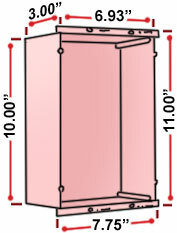 Optional trim frame should be ordered separately. Surface Mounting Frame, Outlet Box, and Trim Frame. Surface Mounting Frame. Will mount any Hall and Elevator Speakerphone as well as any of the GB522V or GB252V Hall and Elevator Telephones equipped with the optional GB62247 Outlet Box. Outlet box w/tamperproof screws. Required for GB522 and GB252 installation. Trim Frame used as finishing for the GB30618 Surface Mounting Frame. For those models not furnished with an outlet box, order the GB62247 Outlet Box separately. The GB62248 Trim Frame is optional on all models, order separately as well. All models are equipped with a straight line ringer. Dimensions of Telephone Sets only (less wall can & frame) are 9.846" H x 6.78" W x 2.84" D.
Elevator/Hall Telephone Set equipped with amplified receiver and a Push-button Pulse dial. No outlet box. Elevator/Hall Telephone Set less Dial e/w amplified receiver. No outlet box. 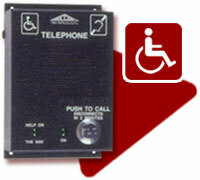 Elevator/Hall Telephone Set equipped with amplified receiver and Push-button Tone Dial. No outlet box. 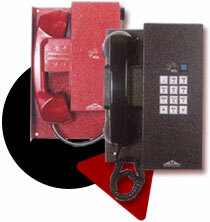 Elevator/Hall Telephone Set e/w amplified receiver, programmable, single number Autodialer (for Tone Output ONLY). No outlet box. Not recommended for use when temperatures are below freezing. Elevator/Hall Speakerphone with 2-minute Auto disconnect, Outlet Box and Ringer. Less Dial and GB62248 Trim Frame. Elevator/Hall Speakerphone with Tone Dial, Outlet Box and Ringer. Less GB62248 Trim Frame. E/w 2 minute Auto-Disconnect Switch. Elevator/Hall Speakerphone with 2 minute Auto Disconnect, 12 Digit Auto Dialer, Outlet Box and Ringer. Less GB62248 Trim Frame. E/w 2 minute Auto-Disconnect Switch. 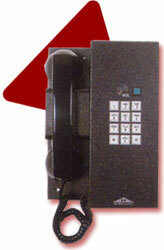 The GB523V and GB524V Telephones are e/w "high stress" armored cords and vandal resistant hardware. Each is available with any of four dial options. 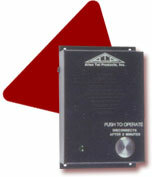 E/w amplified receiver and auto volume reset button. Baked on enamel finish may be ordered in either black or red. GB523 models are designed to be mounted in existing outlet boxes that are at least 7"W x 10"H x 3"D or with the optional GB62247 Outlet BOx and GB62248 Trim Frame. GB524 models are designed to flush mount in an existing opening. They come complete with the outlet box, trim frame and a magnetic hinged door e/w a pull handle. No dial, frame or can. Automatic Tone Dial, 12-digit, line powered, no frame or can. Pushbutton Pulse Dial, no frame or can. Tone dial, no frame or can. Pulse dial. Furnished with GB524-L1 Wall Can/Door and frame assembly. No dial. Furnished with GB524-L1 Wall Can/Door and frame assembly. Line powered, single line programmable SND. Furnished with GB524-L1 Wall Can/Door and frame assembly. Tone dial. Furnished with GB524-L1 Wall Can/Door and frame assembly. Wall Can/Door and Frame Assembly. The GB31454 and GB31454-SND measure 7"H x 4.5"W x 2.5"D. They are pushbutton operated, the line being connected when the pushbutton is momentarily pressed. They also have a 2-minute "Time-Out" feature which disconnects the call after 2 minutes. An LED is provided to indicate an "Off Hook" condition. The GB31454 is for Auto Ring Down or Dedicated lines, and the GB31454-SND is e/w a programmable, single number autodialer. The GB31560 measures 9.7"H x 4.5"W x 2.5"D. It is the same as the GB31454 except that it has a tone dial. The GB31454, GB31454-SND and GB31560 Mini-Elevator Speakerphones are designed for indoor applications with limited space, such as elevators, parking ramps, campuses and door entry. They can be surface mounted or flush mounted in existing wall cans. They are powered by the telephone line with no batteries or AC power required. They are finished in black textured baked-on enamel. Mini-Elevator/Hall speakerphone w/2 min automatic disconnect for ARD circuits. Mini-Elevator speakerphone w/automatic dialer, equipped with 12 digit programmable sutomatic dialer, ringer and a 2 minute automatic disconnect. AllenTel Products makes it easy for you to comply with the American Disabilities Act (ADA) as it applies to Hall and Elevator Telephones. Check the following features: Two New MINI SPEAKER-PHONE designs are available - the GB31454SND-ADA for automatic 11 digit single number emergency dialing and the GB31454-ADA without the single number dial for automatic ring-down applications. Mini Elevator Speakerphone e/w 11 digit Single Number Dialer. Emergency telephone with 11 digit single numbered dial. Push Button A push and release push-button activates the single number dial or a ring-down line to connect the speakerphone to the emergency operator. A 2 minute Auto Disconnect (Time Out) is provided. Braille Labels For those with impaired sight, a Braille label marked "Telephone" identifies the product. A Braille label on the push-button marked "Push" completes the instruction. Lamps Two LED lamps are provided for the hearing impaired. The green LED operates when the push-button is depressed indicating the call is being activated (off-hook condition). The "Help Is On The Way" LED is controlled by the emergency operator and provides visual confirmation. I.D. Tones A three digit tone signal is automatically transmitted to the emergency operator to indicate the location of the caller. Auto Answer The operator may initiate a call to the telephone and monitor for indications of a suspected emergency. Specifications All units are designed to meet requirements of the American Disability Act, Appendix B, Paragraph 4.10.14. The standard finish is black-textured, baked-on enamel. Other colors available on special order. The GB31454 is 7" H x 4.5" W x 2.5"D. The GB555 is 9.846" H x 6.78" W x 2.84"D.